When rivers were our superhighways, bateaux did the heavy lifting. As transportation technology, bateaux were about as rudimentary as it gets. They were shallow-draft, open wooden boats propelled down-river by current and up-river by human muscle. But until the coming of railroads in the middle of the 19th century, they were a formidable engine of commerce. The bateau above is hauling cotton on the Haw River near the mill town of Haw River, date unknown. 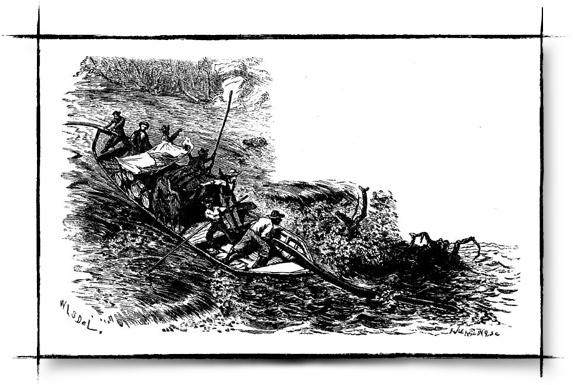 Bateaux could carry more than wagons, travel farther upriver than steamboats. 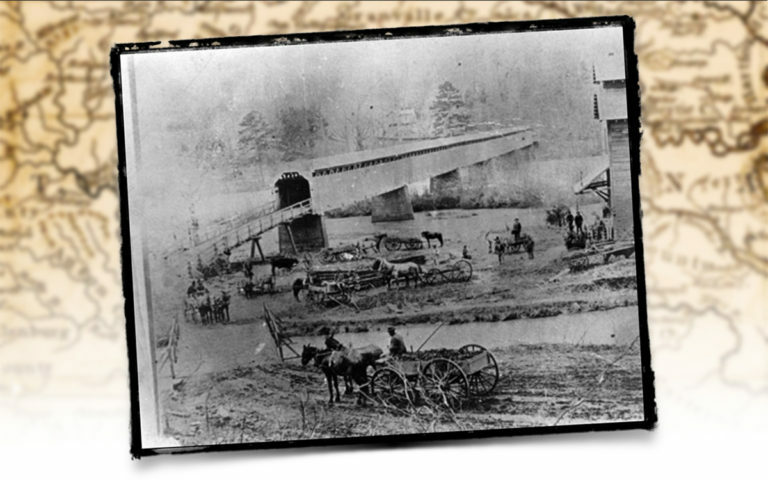 In the early 1800s, the dreadful state of almost all North Carolina roads severely limited the load capacity of farm wagons headed to market. Primitive roads – deeply rutted in dry times and quagmires after a rain – challenged even the brute pulling power of massive oxen. A bateau, on the other hand, could be piled high with as much as six tons of cargo no matter the weather. Crews propelled the boats with wooden poles, and steered using large sweeps bow and stern as they plied the Roanoke and Cape Fear River systems. Running downriver, sometimes on placid water and sometimes through angry rapids, bateaux transported agricultural products outbound to ocean ports at Norfolk and Wilmington. 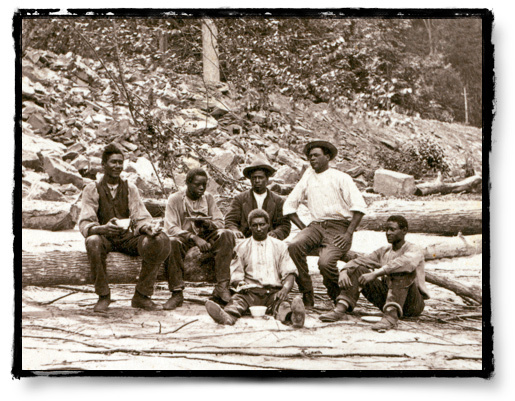 Poled against the current on the labor-intensive push back upriver, they supplied the up-country with manufactured goods and imported staples such as coffee and sugar. Shallow draft let bateaux work where other boats could not. A bateau had a draft of only eighteen inches, so it didn’t require much water under it. This was important on North Carolina’s rivers, where low water levels often ruled out the use of larger craft. Low water levels were common even on the larger Piedmont rivers, especially in the summer. And even in times of high water, the shallow-draft bateaux were able to penetrate into the Piedmont far beyond the reaches of the steamboat. 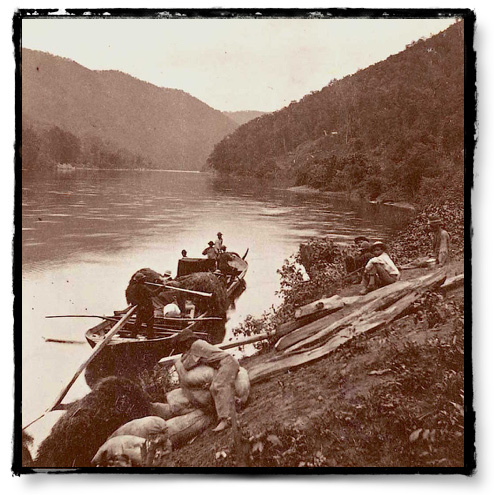 On the Roanoke River, for example, steamboats served the farmers of the coastal plain by connecting them with foreign markets via the ocean port at Norfolk. But steamboats could go no farther upstream than the fall line rapids at Weldon, NC. (Weldon was also a key railroad connection for north/south rail service.) 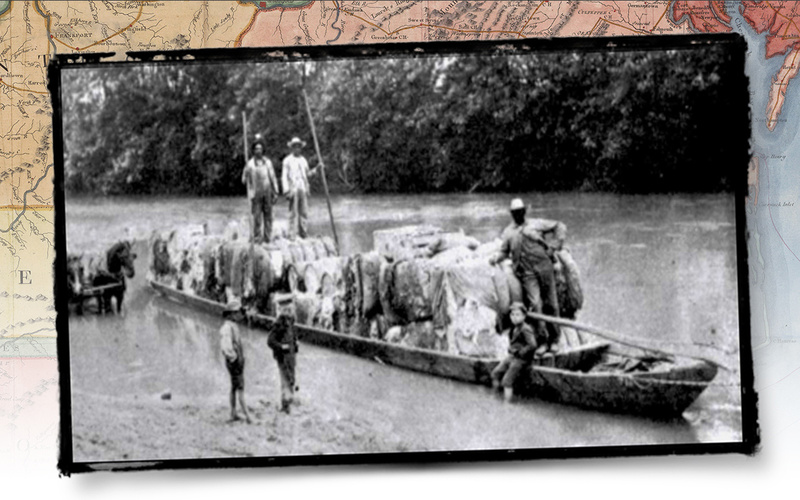 It was bateaux, working hundreds of miles of water in the upper Roanoke, Dan and Staunton Rivers, that made market access possible for the farms of Piedmont North Carolina and Virginia. Bateaux transported agricultural bounty to the waiting steamboats and trains at Weldon and thence to markets beyond. The life of a bateauman might seem idylic, but there was hard work and danger. At Gaston I had seen a number of long, narrow, canoe-like boats, of light draft, in which the produce of the country along the head waters of the Roanoke was brought to market. They were generally manned by three men each, who were sheltered at night under a hood of canvas, stretched upon poles, in the stern of the boat. The mouth of this hood opened upon a bed of clay, laid upon the boat’s bottom, on which a fire was made, that would keep them warm, and cook their food. An equally picturesque scene with that of the wagon camp was a collection of these boats, moored at night under the steep river bank, the negroes reclining under the dusky hoods, or sitting on the gunwales, cooking and eating their hoe-cake, smoking, singing, or telling of their adventures on the passage. The cargoes of these boats were chiefly composed of meal, hides, and tobacco, and at Gaston they were transhipped, by rail, to some of the Virginia ports. Olmsted saw the idylic side of being a bateauman, but working on the crew of a river boat was grueling and dangerous work. And the work didn’t necessarily end when the day’s travel was over. For Bateaux crews camping on the shore at night, it was not unusual to have to defend their cargo and themselves from pirates, thieves, and other bad actors. A museum and a yearly festival celebrate the legacy of the bateaux. The historic significance of bateaux is on display at the Roanoke Canal Museum in Roanoke Rapids, NC, where preserved boats and modern multimedia presentations tell the story. And each June in Virginia, the James River Batteau Festival celebrates these classic boats in an 8-day journey down the James River featuring replica bateaux.